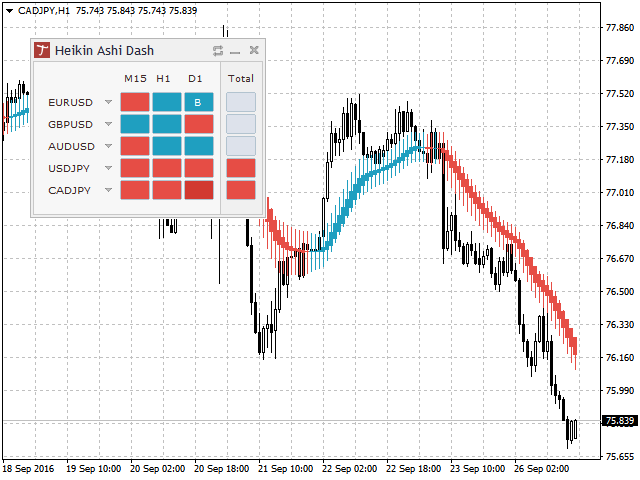 Tipu Heikin Ashi Dashboard is based on the Tipu Heikin Ashi Pro indicator. Please contact me here at MQL5 if you would like to use this panel for your custom signals. 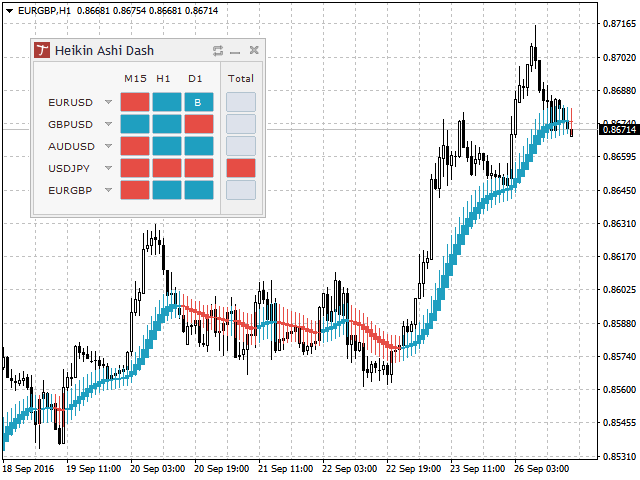 Tipu Heikin Ashi Dashboard is a multi-currency, multi-timeframe panel created to help traders in analyzing the markets quickly using the Heikin Ashi indicator signal. The dashboard panel is designed to help traders quickly change symbols and periods. If you are constantly missing trade opportunities while browsing through the charts, this indicator is for you. This dashboard adds alerts features for mobile, on screen, and email. Heikin means "the average", and Ashi means "foot" in Japanese. Heikin-Ashi is the Japanese charting technique that uses averages of prices for plotting candles. This technique smooths some noise in the candle charts in effort to give a better trend picture. Tipu HA Pro smoothes Heikin Ashi even further by plotting Heikin Ashi candles as simple moving average of the original Heikin Ashi. Choose your alert and never miss a signal again. An easy to use Dashboard Panel that shows the trend + signal of the selected timeframes. Customizable panel. The dashboard can be moved to any place on the chart or minimized to allow more space. Tipu Heikin Ashi Dashboard is very simple and easy to use, just drag the indicator to the chart to get the dashboard, then wait for your signal before you trade. Heikin Ashi Type - choose between a simple Heikin Ashi or a smoothed Heikin Ashi. ... 1 Mins ? : show 1 min trend + signals on the dashboard, select true/false. ... 5 Mins ? : show 5 min trend + signals on the dashboard, select true/false. ... 15 mins ? : show 15 min trend + signals on the dashboard, select true/false. ... 30 Mins ? : show 30 min trend + signals on the dashboard, select true/false. ... 1 hour ? : show 1 hour trend + signals on the dashboard, select true/false. ... 4 hour ? : show 4 hour trend + signals on the dashboard, select true/false. ... 1 day ? : show 1 day trend + signals on the dashboard, select true/false. ... 1 week ? : show 1 week trend + signals on the dashboard, select true/false. Uptrend Color: settings for the uptrend color on the dashboard. Buy Signal Color: buy signal color on the dashboard. Downtrend Color: settings for downtrend color on the dashboard. Sell Signal Color: sell signal color on the dashboard. Alert Mode - select "Alert each TF" for buy/sell on each time frame, and "Alert when TF align" when all the TF on the dashboard align. Good indicator to check the main trend quickly on all timeframes and pairs. Fixed problem with saving symbols on terminal close.